My old friend Sigmund Freud claimed that most children fantasise about dolls coming to life, and psychologist Ernst Jentsch theorised that uncanny feelings arise when there is an intellectual uncertainty about whether an object is alive or not, and also when an object that one knows to be inanimate resembles a living being enough to generate confusion about its nature. Robot engineer Masahiro Mori expanded on Freud and Jentsch’s theories to develop the ‘Uncanny Valley’ hypothesis, which states that, as a robot’s appearance becomes increasingly human-like, a human will have an increasingly positive response to that robot, until a point is reached where the response changes quickly to one of repulsion. If an object is obviously enough non-human, its human characteristics will stand out, and be endearing. 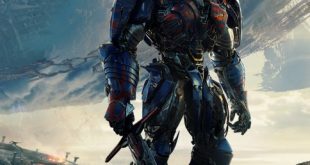 However, if that object reaches a certain threshold of human-like appearance, its non-human characteristics will stand out and become disturbing. Although Mori was concerned particularly with robots, his theory has been seen as applicable to all inanimate objects that sufficiently seem as though they might be animate. 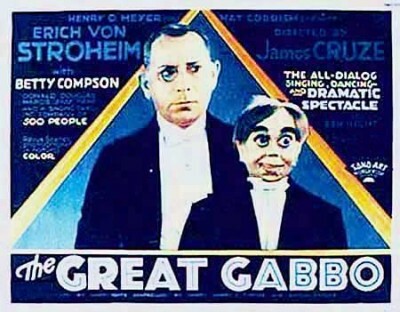 The Great Gabbo (1928) follows a brilliant ventriloquist known as Gabbo (Erich Von Stroheim) who, as he spirals into madness, increasingly uses his dummy ‘Otto’ as his only means of self-expression – an artist driven insane by his work. Gabbo’s gimmick is his astonishing ability to make Otto talk and sing while Gabbo himself smokes, drinks and eats. Gabbo’s girlfriend and assistant (Betty Compson) loves him, but is driven to another performer (Donald Douglas) by Gabbo’s deteriorating personality. 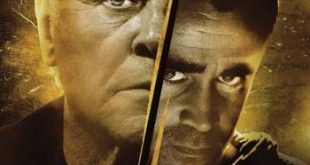 The film’s basic plot and themes would later be resurrected many times, most famously in the British anthology film Dead Of Night (1945), two episodes of the classic television series The Twilight Zone (Caesar And Me, and The Dummy), as well as the Anthony Hopkins film Magic (1979). 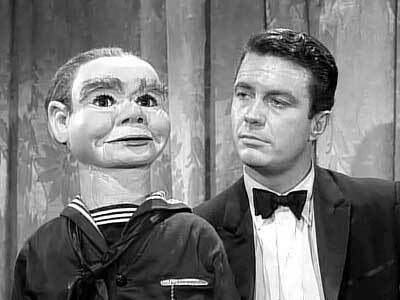 The Twilight Zone episode The Dummy opens with ventriloquist Jerry (Cliff Robertson) and his dummy ‘Willy’ performing in New York City. After the act he goes back to his dressing room and begins to drink from a liquor bottle. He tells his agent that Willy is alive and that he is at the mercy of the dummy. 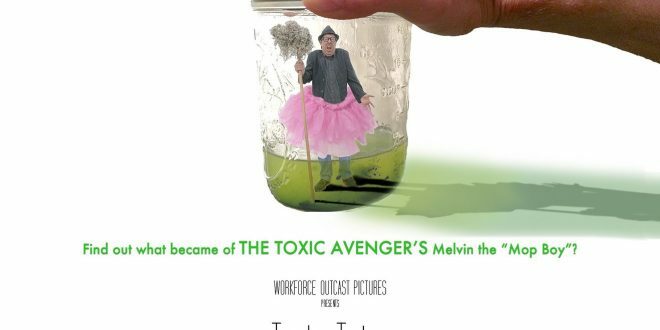 The agent does not believe him and thinks he might need psychiatric help. Jerry decides that he is going to perform with a different dummy – ‘Goofy Goggles’ – and locks Willy in a trunk. After the second act, Jerry says he is leaving to go to another city and try to get away from Willy. His agent tells him that it doesn’t matter where he goes, he’ll still have this delusion if he doesn’t deal with it here and now. While he’s standing outside of the back door to the theatre, he hears faint whispers of Willy’s voice. He sees the dummy’s shadow and continues to hear his voice until a co-worker from the theatre walks up and asks if anything is wrong. Jerry invites her to get a coffee, but does it nervously and eccentrically, thereby causing the woman to become frightened and run away. As soon as she leaves, he hears Willy’s voice again and runs back into the theatre. He goes into the dark dressing room, opens the trunk and throws the dummy on the floor, smashing it. 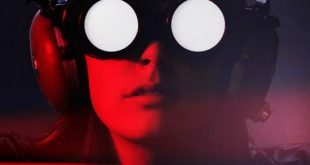 But when he turns on the light, he realises that he smashed Goofy Goggles. He can’t understand how he could have been mistaken. He sees Willy sitting on the chair, laughing. Jerry asks how he can be real when he’s made of wood, and Willy tells him that it was he, Jerry, who made him alive. Realising the truth, Jerry lowers his head as Willy cackles crazily. The scene cuts to a stage in Kansas City announcing that the next act will be ‘Jerry and Willy’, and we see the back of the man who walks out. As the camera rotates to the front, it is revealed that the man is actually Willy, and he is holding a dummy that looks just like Jerry. 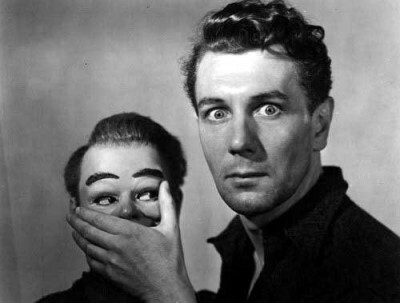 In the other classic Twilight Zone episode, Caesar And Me, an unsuccessful ventriloquist commits robberies based on the advice of his dummy ‘Little Caesar’. The landlady’s niece (who loves to play with a blowgun loaded with pretend ‘poison’ darts) learns about his crimes and decides to call the police. Unable to defend himself, Jonathan is taken to jail, and the dummy gets away with it. The dummy then plans to run away to New York with the landlady’s niece. “What about my aunt?”, the niece wonders. Caesar asks, “You still got those poison darts?” He then chuckles at seeing the girl’s fiendish gleam in her eyes. 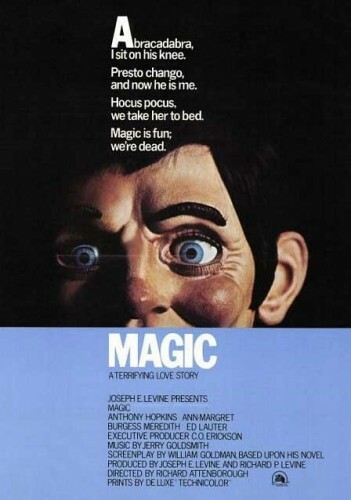 In Magic (1979), Anthony Hopkins plays Corky Withers, ventriloquist with a foul-mouthed dummy named ‘Fats’ and is becoming a huge success. His powerful agent is on the verge of signing Corky for his own television show, but Corky bails out, claiming to be afraid of success. In truth, he doesn’t want to take the required psychological testing because doctors might find out that he suffers from a multiple personality disorder, and that even off-stage he hears Fats talking to him. He meets with his high-school crush, Peggy Ann Snow (Ann Margaret), who is in a passionless marriage. After a tense confrontation in which his agent discovers the truth about Corky’s mental state, he demands that Corky get help. 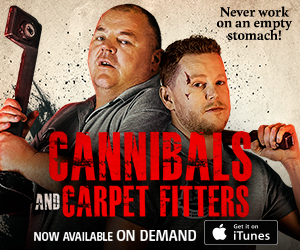 Fats, however, convinces Corky to kill his agent. Corky does this by using Fats’ hard wooden head. The next morning Fats becomes even more possessive and jealous when Corky says that he plans to leave Fats behind so that he and Peggy can go away together. When her disgruntled husband Duke decides to search Corky’s cabin, Fats kills him with help from Corky (the dummy stabs Duke while Corky is covered by a curtain behind him). Peg thinks everything is fine until Fats tells her that Corky’s card tricks are only a ruse he uses to seduce women, and that Peg is only the latest of his conquests. Repulsed, she rejects Corky and locks herself in her bedroom. Fats immediately asserts his authority by ordering Corky to kill Peg. 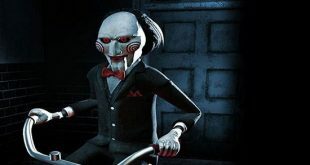 A short while later, Corky returns with a bloodstained knife, and Fats seems pleased – until it is revealed that the blood on the knife is Corky’s, having committed suicide so that he won’t kill anyone else. As a result, Fats also feels ‘faint’ and they wonder which of them will die first. 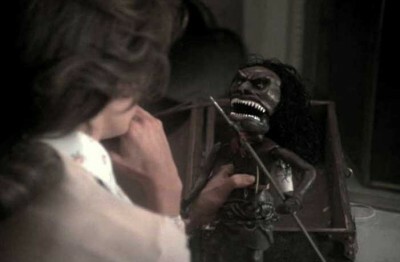 Although there have been many chilling films featuring living dolls, doll-like people, and ventriloquist dolls, most baby-boomers will remember the made-for-television movie Trilogy Of Terror (1975). 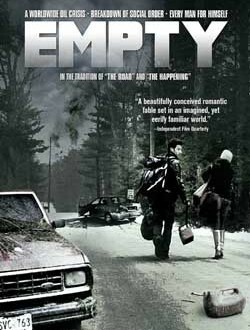 They may not recall the title of the film or its star (Karen Black) or even the first two comparatively bland stories, but they can often recall the events of the third tale, adapted from the short story to the screen by its author Richard Matheson, who based Amelia on his own short story, Prey. Amelia lives by herself in an apartment. She arrives home after shopping and unwraps a Zuni hunting doll, equipped with razor-sharp teeth and a spear. A scroll comes with the Zuni, claiming that the doll contains the actual spirit of a Zuni hunter, and that the gold chain adorning the doll keeps the spirit trapped within. The moment Amelia leaves the room, the Zuni doll’s golden chain falls off without her knowing. Later, Amelia is preparing dinner, using a carving knife. She enters the darkened living room, and realises the doll is not on the coffee table. A noise is heard in the kitchen and when investigated, the knife is missing. Lured back into the living room, she is suddenly attacked by the doll, which stabs at her ankles viciously. Bloodied and terrified, Amelia flees, and manages to get in her bedroom and calls the police, but the doll enters the room, prompting her to keep running, shutting the bathroom door behind her. Sitting in the bathroom, the doorknob begins to turn and the doll runs in quickly. 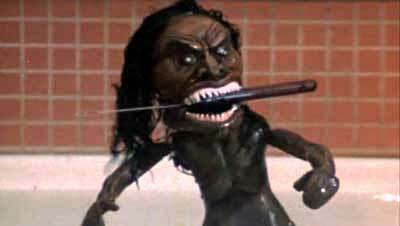 Amelia grabs a towel and covers the doll, trying to drown it in the bath tub. 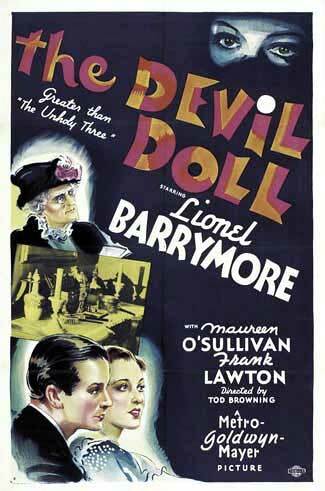 The ongoing struggle moves into the living room closet, where Amelia ends up trapping the doll in a suitcase. The doll uses the carving knife to cut it’s way out of the suitcase and attacks Amelia once more. She runs into the kitchen, and disarms it with a kick, and receives a nasty bite to the neck. She manages to hurl it into the oven and listens to it howling and screaming as it catches fire. Soon the screams eventually stop. Wondering if her ordeal is over, she opens the oven and is suddenly overcome – fade to black. The next time we hear her (but do not see her face) placing a call to her mother, inviting her over. She then rips the bolt from her front door and crouches down low in an animalistic manner, hiding in the corner with a butcher knife. She stabs at the floor with the weapon, grinning ferally and revealing the horrific teeth of the Zuni doll. Needless to say, we’ve been terrified by dolls or doll-like creatures since the invention of the cinematograph and before. 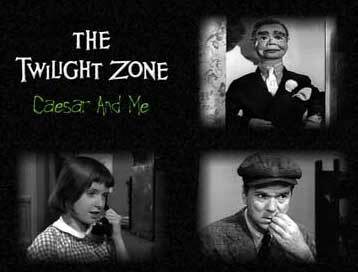 There are other classic Twilight Zone stories, such as Living Doll (Talky Tina) and The Invaders (doll-sized aliens that are revealed to be humans on an alien planet of giants). 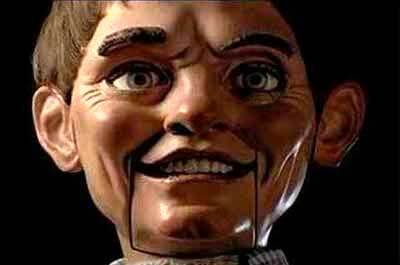 There’s Mister Sin, the murderous ventriloquist doll played by actor Deep Roy in the Doctor Who story The Talons Of Weng-Chiang. 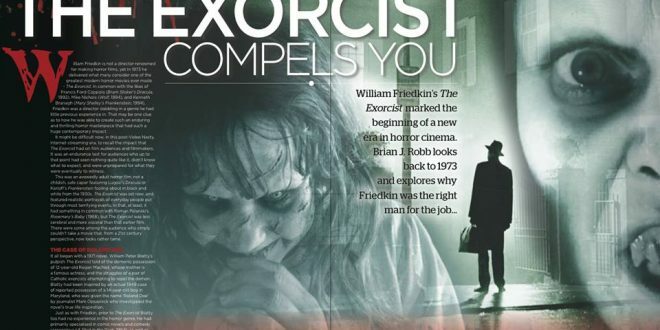 The Homunculi in The Bride Of Frankenstein (1935), tiny criminals in The Devil Doll (1936), Doctor Cyclops (1940), Attack Of The Puppet People (1958), a ventriloquist doll named Hugo in Devil Doll (1964), Asylum (1972), Don’t Be Afraid Of The Dark (1973), Deep Red (1975), etc. The list of films goes on forever and would, of course, require far more space than is available here. 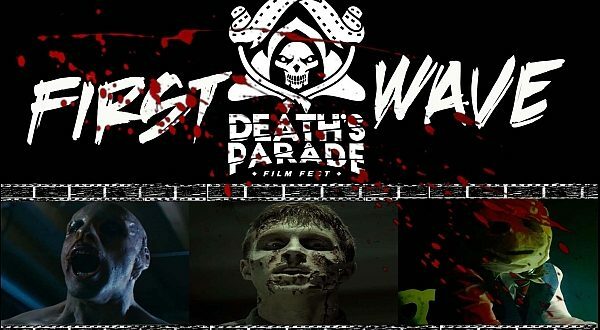 So please join me next week when I have the opportunity to present you with more unthinkable realities and unbelievable factoids of the darkest days of cinema, exposing the most daring shriek-and-shudder shock sensations to ever be found in the steaming cesspit known as…Horror News! Toodles! 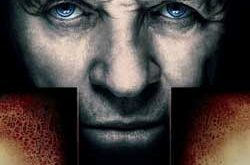 Dee Wallace & Tom Downey vs. Supernatural “DOLLS” In New Horror Thriller!! Thanks for reading! 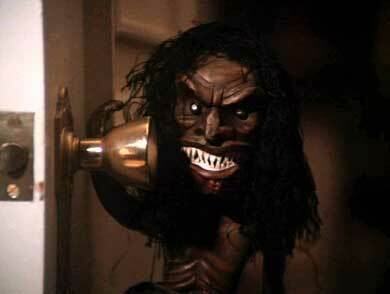 Absolutely, the final story in Trilogy Of Terror makes it one of the most memorable and chilling made-for-TV movies of the seventies, along with The Night Stalker, Don’t Be Afraid Of The Dark, and A Cold Night’s Death (a big influence on John Carpenter when remaking The Thing).